So, this blog is about trying things out...but... sometimes those 'tries' don't go so well! I figured I'd share my latest Nail Fails. They look like I asked a 5 year old to do my nails for me- o well! My first bright idea was to use the 3-ring paper stickers to create a french manicure line. For some reason, the sticker part didn't really work and my lines were not clear at all. Nail polish went underneath the sticker and made my nails all messy! Does anyone have any tips for this? I've seen the technique used many times before and it usually looks so clean and nice. What did I do wrong with the sticker? 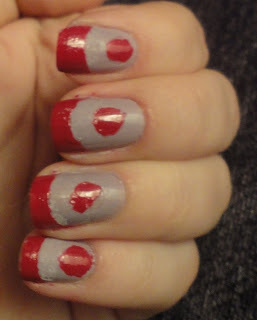 I also decided to paint inside the circle on one hand, just for a fun variation. And... it turned out looking horrible. At least I tried! Haha. My second bright idea was simply a nail polish color I've had laying around in my pile for years. Well, it turned out to be clumpy and gross on my nails. Awesome..... LOL. Two total nail fails. Oh well! I wish I could find these reinforcement stickers anywhere! But these are the steps I have to follow doing any sort of tape mani. ok thanks! idk why it came out so messy. i got my stickers at Staples. you can probably also find them at office depot, walgreens, etc. i would think. Maybe try rubbing the sticker onto the top of your hand first and then putting it onto your nail. And make sure you rub the sticker onto your hand really hard so there are no gaps. I have used sticky tape before to do manicures and this happens to me sometimes too.So annoying!